During a recent inspirational hardware store visit, I discovered a rotary wire brush made by Norton™ called the Rapid Strip Brush™. It is used with an electric drill and produces results comparable to bead blasting or a needle scaler. The package says it can be used to abrade metal, masonry and fiberglass. I immediately thought of a fiberglass application that I wanted to try it on. Unfinished areas in older fiberglass boats have lots of texture created by the pattern of woven roving fiberglass used to make the hull. In order to prepare this surface for secondary bonds with WEST SYSTEM® epoxy, we recommend grinding the texture away so none of the surface has been left unsanded. 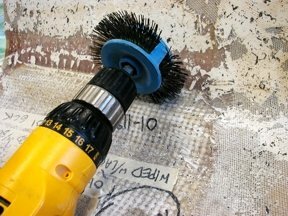 I wanted to see if the Rapid Strip Brush could be used to abrade the deep parts of the texture without cutting away the tops of the fiberglass bundles. So we ran some tests using the PATTI meter (pneumatic tensile test instrument) to compare how well WEST SYSTEM epoxy would adhere to textured, woven surfaces prepared with the Rapid Strip Brush vs. sanding smooth with 80-grit sandpaper. We prepared the surface of an old piece of fiberglass laminate by first wiping it down with a solvent designed to remove wax and silicone contaminants. We used the wipe on and wipe off method in which the solvent is wiped off while the surface is still wet and before the solvent flashes away. Half of the laminate was sanded completely flat with 80-grit sandpaper and half of it was prepared by running the Rapid Strip Brush in a drill motor in two directions, one 90° from the other. This was to insure that the low spots between fiberglass bundles were abraded completely. We brushed off both surfaces with a clean bench brush. Then we glued five PATTI studs in place for each preparation, using 105 Resin/206 Hardener and a bit of 404 High-Density Filler. All tests resulted in 100% substrate failures. Fiberglass laminate sanded flat with 80-grit resulted in an average PATTI result of 726 psi. Fiberglass laminate prepared with the Norton Rapid Strip Brush achieved an average PATTI result of 936 psi, a 29% improvement when compared to sanding. This entry was posted in Boat Repair, Fiberglass Boat Repair, Materials Testing, Techniques & Tips and tagged 21, adhesion, Epoxyworks #21, Fiberglass, laminate, patti meter, Spring 2003, Tom Pawlak on November 24, 2014 by ewadmin.